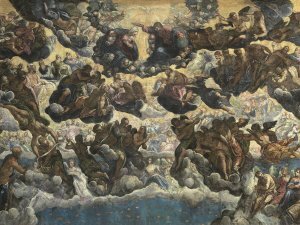 On occasion of the Thyssen-Bornemisza Museum’s 20th Anniversary, the museum has undertaken the study and restoration of Tintoretto’s The Paradise, one of the masterpieces of the permanent collection. The restorers carry out their activities in full view of the public, to show the technical and artistic results in “real time”. From 9 July to 2 September 2012, the Moneo Rooms at the Museo Thyssen-Bornemisza is hosting a small exhibition on the technical study which was carried out prior to the restoration of Tintoretto’s The Paradise. The aim is to draw the public’s attention to the techniques used in the restoration of works of ar t in general. The exhibition illustrates how technical studies act as tools of analysis and support helping the restorer to decide what course of action to take and methods to use before undertaking the restoration of a work of art.